Gen Xtinct: Classic Clip Monday: Whatsamatta you? Hey! Oh, I know you remember this novelty song from the 1980s. Joe Dolce (who?) 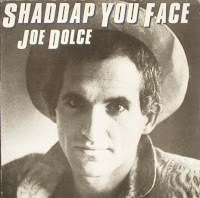 sings "Shaddap You Face," which somehow wormed its way into my brain in high school and became one of those songs, and phrases, you just can't get out of your head. Also, the singer sounds like Father Guido Sarducci to me. Funny you bring this up now -- I sing this often to my 4 month old daughter when she's crying. It's perfect to sing over and over, the Hey gets her attention and she sometimes stops.